Earlier this month, the Royal London Hospital in Whitechapel unveiled its recent £650 million redevelopment. An East-End landmark, the hospital has original buildings dating back to the 18th century, so the expensive revamp was very much needed. Covering an area equivalent to 40 football pitches, the Royal London employs 3,000 staff and contains no less than 26 operating theatres. During the re-fit, three tall towers were added; two being 16 storeys in height, the other 10 storeys. The Royal London’s three new towers, tucked amongst the existing buildings. Constructed mainly from glass, the towers are state-of-the-art; designed to maximise light and provide beautiful views over the City, thus ensuring that the environment is as pleasant as possible for the patients being treated within. The Royal London is also home to London’s Air Ambulance, and the roof of one of the 16 storey towers contains a helipad for this purpose. In short, the extensive updates have ensured that the Royal London is now an ultra-modern, cutting edge facility which can continue to treat patients as it has done for 100s of years. Over the years, countless patients have passed through the Royal London. But perhaps the most famous person to spend time there was Joseph Merrick; a young man from the late Victorian era who suffered from horrendous disfigurements. Born in Leicester in August 1862, Joseph Carey Merrick was a healthy baby, displaying absolutely no sign of the terrible disease which would come to define his life. However, symptoms began to develop in early childhood. At 21 months old, swellings began to develop on Joseph’s lips and, by the time he was 5 years old, his skin had roughened and loosened. A bony lump had also developed on his forehead. To add to his woes, Joseph also suffered an accident at some point in his boyhood, causing damage to his left hip; a mishap which left him with a limp for the rest of his life. Despite his poor medical condition, Joseph still managed to attend school as a regular child. Joseph was very close to his mother, Mary Jane Merrick; a stable figure in his early life who provided him with much needed love and affection. Tragically, in 1873 when Joseph was 11 years old, Mary contracted pneumonia and died. Just over a year later, Joseph’s father re-married a woman named Emma Wood Antill, and the new family moved in together. Sadly, neither his father nor new step-mother displayed any sympathy towards the deformed child, constantly chiding him for being a burden. As a result of these conditions, Joseph ran away from home on several occasions, but was always quickly tracked down by his father. At the age of 13, Joseph secured a job rolling cigars in a factory, but this employment only lasted for two years as increased swelling on his right hand made the work practically impossible. Frustrated by his inability to earn his keep, Joseph’s father secured a hawker’s licence for his son; thus permitting him to sell items of haberdashery door to door. However, this calling also proved unsuccessful. Due to his increasing facial deformities, many people were horrified by Joseph’s appearance, so much so that potential customers wouldn’t even answer the door. Those who did found it difficult to understand the young salesman, as the growths around his face and mouth were having an impact on clear speech. As he shuffled his unprofitable days around Leicester, Joseph found himself being increasingly followed and harassed by onlookers who were only too keen to stare and taunt. Through no fault of his own therefore, Joseph Merrick was unable to maintain stable employment… and finally ended up resigning himself to that much dreaded Victorian institution- the workhouse. Joseph remained in the Leicester Union Workhouse for four years. As he turned 20, it began to dawn upon him there was perhaps money to be made from his deformities, via one of the more dubious Victorian pastimes- the ‘Freak Show’. With this in mind, the young Merrick wrote to Sam Torr; a local comedian and owner of Leicester’s ‘Gladstone Music Hall’, which was situated a mere 50 yards from where Joseph had grown up. After receiving the letter, Sam Torr visited Joseph and, upon seeing his appalling deformities, agreed that there was indeed cash to be made. In August 1884, Joseph Merrick finally departed the workhouse, his new career as a showpiece quickly taking him on tour. During his time in the travelling show, Joseph befriended a fellow ‘freak’; Harry Bramley, who was a midget. A rare photo of Harry Bramley; one of Joseph Merrick’s earliest friends… seen here fighting a Wallaby! Although small in stature, Harry was a noted boxer. He was also fiercely protective of his new pal. Apparently, on a visit to Northampton, a gang of local hooligans began to harass Joseph in the market square…. needless to say, wee Harry was on hand to promptly lay the ring leader out! In November 1884, ‘The Elephant Man’ was brought to London, where his management was transferred to Tom Norman; a seasoned showman in charge of a number of East-End based ‘Penny Gaffs’; cheap places of theatrical entertainment specifically aimed at the lower classes. Tom Norman had also operated similar venues in Islington and Hammersmith. One of 18 children, Tom was a flamboyant character who knew how to keep on his toes. Nicknamed ‘The Silver King’ (on account of the numerous medallions and American coins which he sported upon his braces), Tom was always looking for a quick way to make money. He once lost his entire life savings at Royal Ascot, forcing him to walk all the way back to London! The East End of London into which Joseph Merrick arrived was at the height of its Victorian notoriety; a vast slum and by-product of the booming Industrial Revolution. Overcrowding had reached epic proportions, and this was coupled with dreadful sanitation, rampant disease, widespread, casual violence, chronic alcoholism and depressingly high rates of mortality. The East End’s infamous ‘Jack the Ripper’ murders were only four years away- indeed, Joseph Merrick was resident at the Royal London Hospital when the nearby, bloody spree occurred, and would have been very much aware of the sensation surrounding the serial killings. The Elephant Man was exhibited in a run-down building on Whitechapel Road. Joseph Merrick also slept at the location, and thus came to call the place home for several months. The premises are still in existence today, although nowadays the building facilitates the much calmer business of selling sarees to the local Bangladeshi community. Tom actually found the wild slant of this advertisement rather distasteful, especially as he’d quickly noted how gentle-natured Joseph Merrick actually was. Once a large enough crowd of punters had been assembled, the showman would lead the gathered group into the shop where, towards the back, Joseph Merrick sat hidden behind a curtain. The curtain would then be drawn aside and Joseph subjected to the stares, shrieks and gasps to which he had become so sadly accustomed. The freak show was situated directly opposite the Royal London- one of the largest hospitals in the UK, and the main source of treatment for the poverty-stricken East End, typically dealing with cases involving injuries from vicious machine accidents and drunken brawls. At the Royal London Hospital there worked one Frederick Treves; a doctor who, at the age of 31, was already a major force in his field. A number of employees at the Royal London had ventured across the road in their spare time to witness the Elephant Man and, upon hearing their reports, Dr Treves’s instinctive medical curiosity was instantly aroused. Contacting Tom Norman, Dr Treves arranged a private viewing one morning before the show opened up to the public. Dr Treves suggested that a medical examination should be carried out, and both Joseph and Tom agreed. Although the journey to the hospital was barely a two-minute walk, Dr Treves was able to observe the great lengths to which the Elephant Man had to go in order to convey himself in public- Joseph possessed a set of clothing which was able to cover him from head to toe; a huge, black- almost theatrical- cloak and a custom-made cap, large enough to cover the huge swellings upon his head. Attached to the cap was a simple mask; essentially a hessian sack, which covered Joseph’s face entirely, but had a slit cut out for his eyes. His feet were swathed in large carpet slippers. 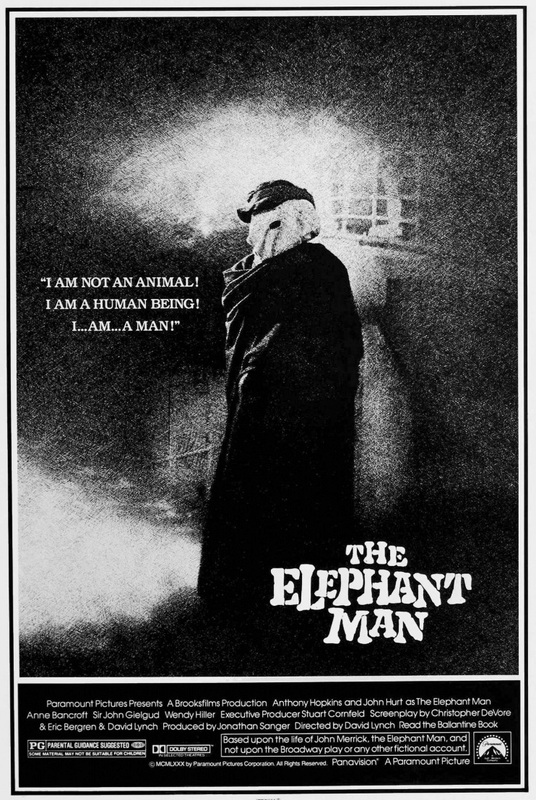 In 1980,‘The Elephant Man‘; the much acclaimed film version of Joseph Merrick’s life was released in cinemas. For his short trip to the Royal London Hospital, Joseph also used a cab- during his time in the city, he would in fact become a regular customer of London’s Hansom cabs thanks to the privacy which they afforded. These traits, coupled with Merick’s great difficulty in speaking clearly, initially led Dr Treves to conclude that the Elephant Man was also an “imbecile”- an assumption which he would later discover to be grossly untrue. Shortly after this examination, Joseph agreed to be presented as a living specimen to the ‘Pathological Society of London‘, which was located on Berners Street in Bloomsbury; a plush world away from the poverty-riddled East End. After several more examinations, Joseph decided to stop his visits. Despite this sentiment, he maintained Dr Treves’s calling card. Mainly due to the nature of his business, some historical accounts have been unkind to Joseph Merrick’s London manager, Tom Norman. However, although the nature of the freak show business inevitably necessitated Joseph being exploited, it seems that Joseph and Tom maintained a good working relationship, each holding a mutual respect during their few months together. Tom split all of the takings 50/50, allowing Joseph to earn more money than he’d ever done in his life. Tom also grew rather protective of his partner. Early on in their relationship, the showman was dismayed to see that Joseph wasn’t even able to lie down and sleep properly. This was a problem which plagued Joseph throughout his life; to lie down like a ‘normal person’ would risk death, the sheer weight of his head being liable to either suffocate him or break his neck. Instead, he had to either prop himself up, or sleep with his head on his knees. Attempting to solve this uncomfortable problem, Tom Norman employed a carpenter to construct a special frame, which it was hoped would be able support Joseph’s head whilst he slept. Although the attempt was sadly unsuccessful, it demonstrates that an intention of care and concern was evident. Despite the apparent popularity of the freak shows, overall public attitudes to such displays were in fact beginning to take a turn. Considered vulgarities, many of the shows were starting to get shut down by police, leading Tom Norman to become anxious that his ‘half-man, half-elephant’ show would be next. Merrick’s management team therefore decided to send the exhibition to Continental Europe. However, once out of the UK, it transpired that freak shows abroad were also on the wane, and the Elephant Man experienced the same increasing hostility which was brewing back home. Joseph’s show ended up in Belgium, where he was granted yet another manager. Although the identity of this individual is unknown, one thing is certain- Joseph’s new administrator was a heartless crook. Whilst on show in Brussels, this mysterious character, realising that the Elephant Man display was losing profit, abandoned his protégé. Even worse, he stole Joseph’s life savings; essentially all of the money which he’d earned whilst under Tom Norman’s wing. The sum- £50- was a considerable amount, equivalent to some £4,000 in today’s money. Alone in a foreign land, unable to speak clearly- let alone in an alien language- and with no friends and no currency, Joseph was left to fend for himself, his only protection coming from huddling himself within his large cloak and mask. Somehow managing to pawn the few items he owned, Joseph made his way to Ostend, where he attempted to board a ferry to Dover… however, the ship’s captain refused to let bedraggled figure onboard. Joseph was now forced to make a further trek to Antwerp. Here he had more success, managing to secure a place onboard a ferry (known as a ‘Railway Steamer’) to Harwich in Essex. The train from Harwich steamed into the huge, London terminal on a Thursday morning; rush hour. As Joseph disembarked, his mask and large cloak immediately drew attention, with people pointing and loud comments being muttered. Like a snowball effect, the crowd grew larger, people curious to see what all of the commotion was. Before long, Joseph was swamped with unwanted attention, cowering and terrified in the midst of it all. He was rescued by two police officers, who barged their way through the deluge and pulled him towards the safety of a third-class waiting room. Once inside the barren cubicle, the policemen had to barricade the doors, as the crowd continued to swell, pressing up against the windows, eager to catch a glimpse of the supposed strange creature. By now, utterly dejected and exhausted, Joseph simply couldn’t face anymore, and collapsed in a corner of the waiting room. In David Lean’s film, Joseph’s nightmare at Liverpool Street was a key moment and, although a dramatized version, the famous scene is an effective depiction of the mob mentality which hounded him that awful morning. The police attempted to help further, but the two kindly bobbies were unable to understand what the stranger was saying, especially as Joseph was now also suffering from bronchitis; the gasping from which did little to help his already tortured speech. Amazingly, salvation came in the form of Dr Treves’s calling card- which, along with the small and much cherished portrait of his mother, was one of the only items Joseph had managed to cling onto during his travels across Europe. Seeing the name and address, the police quickly sent word to the Royal London, requesting the doctor attend. When Dr Treves arrived at Liverpool Street, the inquisitive crowd had grown so large, that he had considerable difficulty in forcing his way through. Upon re-discovering the Elephant Man, the doctor assured the police that he would assume full responsibility for the unfortunate fellow. Joseph was led to a hansom cab and promptly rushed back to the Royal London Hospital in Whitechapel, where the next stage of his tumultuous life was about to begin. I look forward to the next instalment.